Great tasting water at every faucet and shower in your home. The H2o Concepts, 1665 Combo is two systems in one. The first part of the system is the patented, certified scale prevention system also know as (AMP Force Technology). It is used to break up the minerals in your water. This product eliminates scale build up in your internal plumbing, which prevents you water from damaging your water using appliances making them last longer. The second part of the system uses the highest quality water filtration medias providing: great tasting, safer, healthier, better quality water for drinking, bathing and other uses at every tap in your home. The H2o Concepts media will remove chlorine and contaminants from the water at every tap and shower in your home or business. The H2o Concepts system is “unique”, combining two systems into one tank. Our system does not use salt or potassium chloride to condition your water. The AMP Force Technology eliminates hard water problems in your internal plumbing. 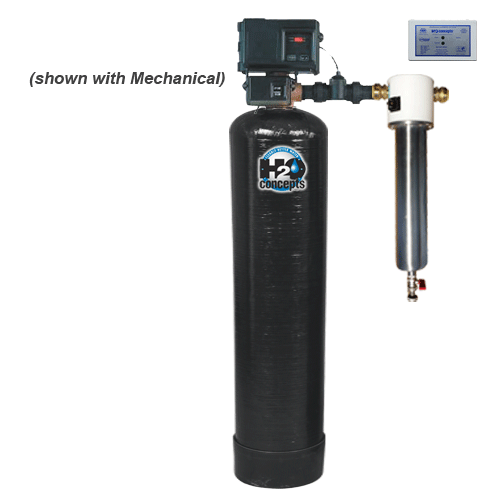 The filtration gives you superior quality water throughout your home. Every system is manufactured by H2o Concepts in our Phoenix, AZ (USA) facility and are built to meet your water specific requirements at your home or business. Water varies in quality from one home to another and that is why it is important to install the right water treatment or conditioner that is based on your water needs. Instead of exchanging the calcium and magnesium bicarbonate for sodium or potassium (ion exchange) like a water softener, the Amp Force™Technology concentrates on the bicarbonate crystals of the minerals. In their bicarbonate form, these minerals form on one-another causing buildup with-in the plumbing and results are premature failure of water using appliances. Calcium and magnesium bicarbonate crystals are insoluble, but can be changed by temperature (energy) into the soluble form of carbonate crystals. The photo below shows bicarbonate crystals that are clumping; this provides an example of how the crystals can buildup inside your plumbing system. Calcite is a type of calcium carbonate crystal that is soluble and has a rhombohedral (dog-tooth like) shape. 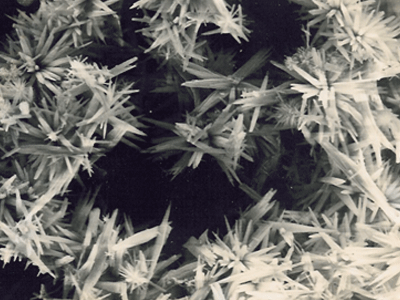 These crystals are small, very adherent and still create deposits in plumbing and fixtures. Typically, boiling water will convert bicarbonate crystals to this form of carbonate crystal. An example would be the hard-to-remove white residue left inside a pan when water is boiled down on a stove. Aragonite is a type of calcium carbonate that is soluble and has an acicular (needle like) shape. 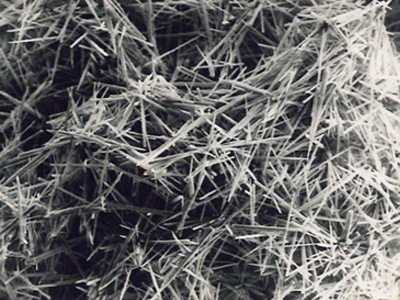 These crystals are very small, but not adherent. This non-adherent form is created by the AMPFORCE™ Technology. The AMP Force™ system sends a computer-controlled high frequency pulse between 2300 and 4200 times per second (to a positive and negative low voltage impulse that is between a stainless steel anode and stainless steel cathode). As water passes, the pulses break up the calcium and magnesium crystals. The KDF media is designed specifically for removing or reducing chlorine and water-soluble heavy metals. It controls scale, bacteria and algae, even in hot water. The process medium received NSF International Certification and is certified by NSF to NSF/ANSI Standard 42 – Drinking Water Treatment Units – Aesthetic Effects. This medium is also in compliance with California’s Health and Safety Code Section 166875 (or commonly know as AB1953) and Vermont Act 193. GAC (Granular Activated Carbon) is developed from organic materials with high carbon contents. H2o Concepts uses GAC in our systems; it’s primary purpose is to absorb natural organic compounds, taste and odor compounds, and synthetic organic chemicals in the water. The carbon will revitalize water to its natural purity. The quartz is used as a regulator and pre-filter to the carbon media. This acts as a regulator for the system, to ensure that water flows evenly and efficiently through the system, allowing the water to have the maximum contact time with the carbon media.